This post show a simple and effective way to setup a continuous integration server and a way to update a test environment on each commit on a developer branch. We want to create e new continuous integration environment using Jenkins to build .NET solutions. Automatically run a new “build and deploy” after a commit on the develop branch. Building/testing software projects continuously. In a nutshell, Jenkins provides an easy-to-use so-called continuous integration system, making it easier for developers to integrate changes to the project, and making it easier for users to obtain a fresh build. The automated, continuous build increases the productivity. Monitoring executions of externally-run jobs, such as cron jobs and procmail jobs, even those that are run on a remote machine. For example, with cron, all you receive is regular e-mails that capture the output, and it is up to you to look at them diligently and notice when it broke. Jenkins keeps those outputs and makes it easy for you to notice when something is wrong. Before installing Jenkins you must download and install Git. For the most part, you’ll select command-line setting, with the exception of Git command line stuff. 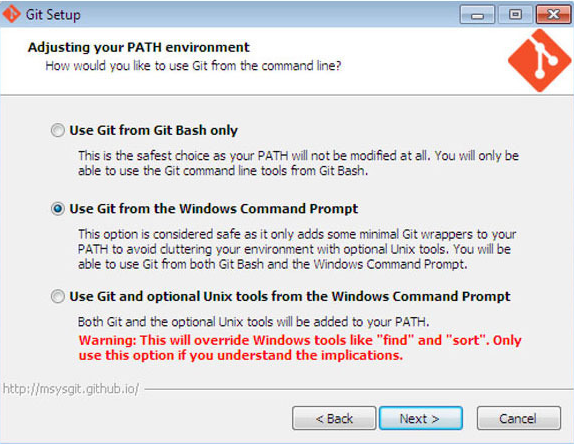 In that case, select “use git from the Windows Command Prompt,” as shown below. Now you can install Jenkins. 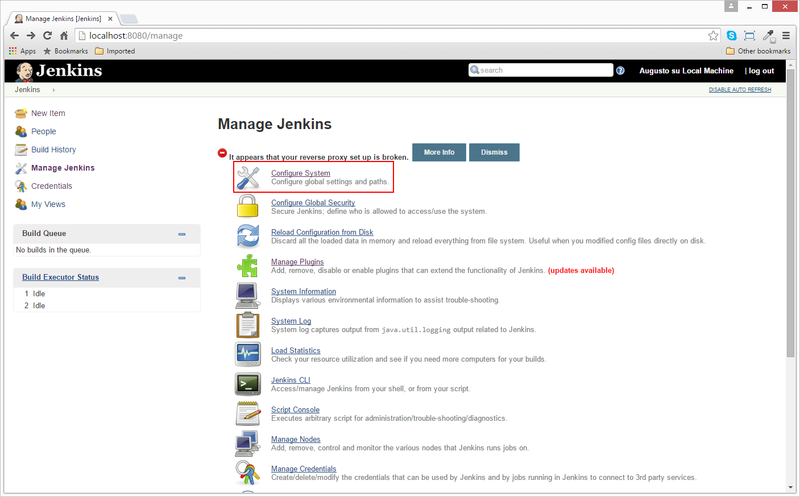 The install wizard will open the Jenkins web page. The Build Plugin we’ll be using is MSBuild this allows us to build a .NET solution. 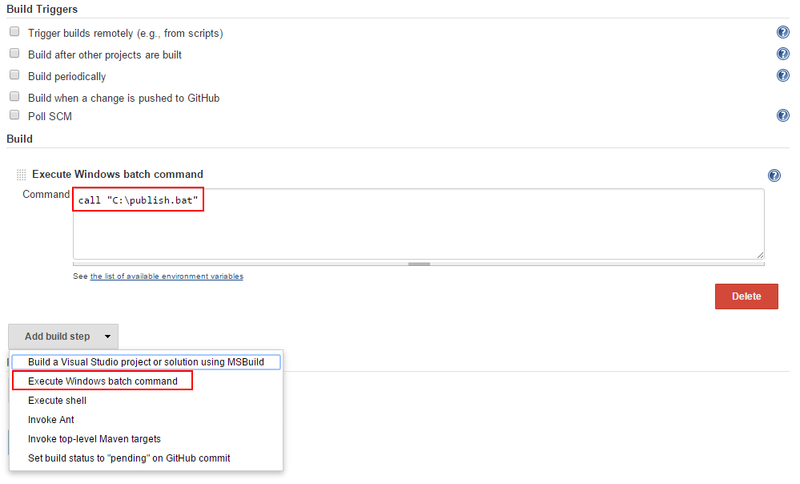 The GIT Plugin – This plugin allows use of Git as a build SCM. MSTest Plugin – This plugin converts MSTest TRX test reports into JUnit XML reports so it can be integrated with Jenkins JUnit features. NUnit Plugin – This plugin allows you to publish NUnit test results. xUnit Plugin – This plugin makes it possible to publish the test results of an execution of a testing tool in Jenkins. Gallio Plugin – This plugin makes it possible to publish Gallio/MbUnit test results. Tick the check box next to each of the required Plugins and then click the ‘Download now and install after restart’ button. Green Balls – Changes Hudson to use green balls instead of blue for successful builds. Who doesn’t want Green Balls! Active Directory Plugin – With this plugin, you can configure Jenkins authenticates the username and the password through Active Directory. Enter and go to the Git section and set the fields with your current Git installation described above. In Jenkins the definition of a build process is called a Job. 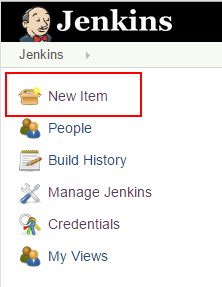 Jobs are created using the main menu on the Jenkins home page. We’ll create a basic Job that will checkout our source and build the solution. From the main Jenkins menu, Click the ‘New Item’ link. You now see the New Job configuration page. 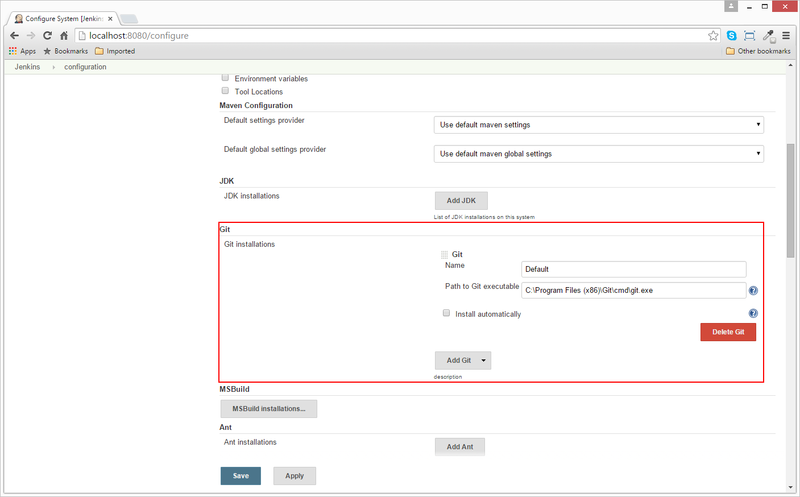 Jenkins will now create the Job workspace on disk and redirect you to the job configuration page. Next we’re going to checkout our solution from source control and build it. 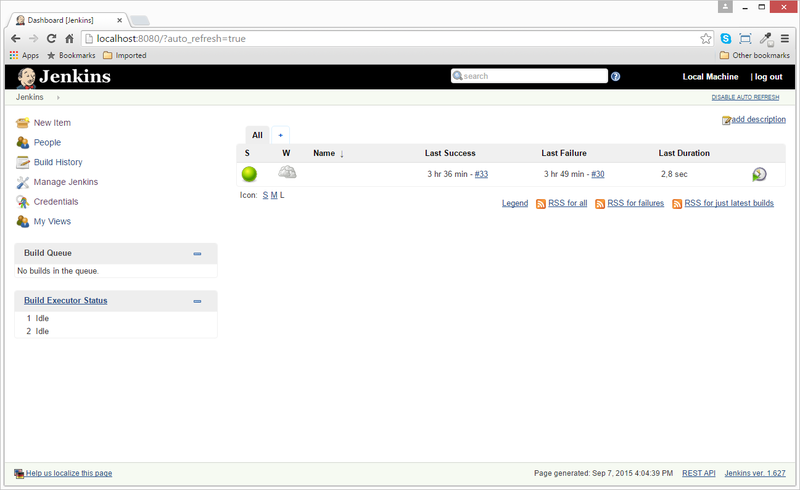 So we first need to give Jenkins details of our source control server. For the purpose of this demo we’ll use Git. Lets setup our Job to grab the source code from this repository. This is done in the” Source Code Management” section of the configuration page. Select the Git radio button. 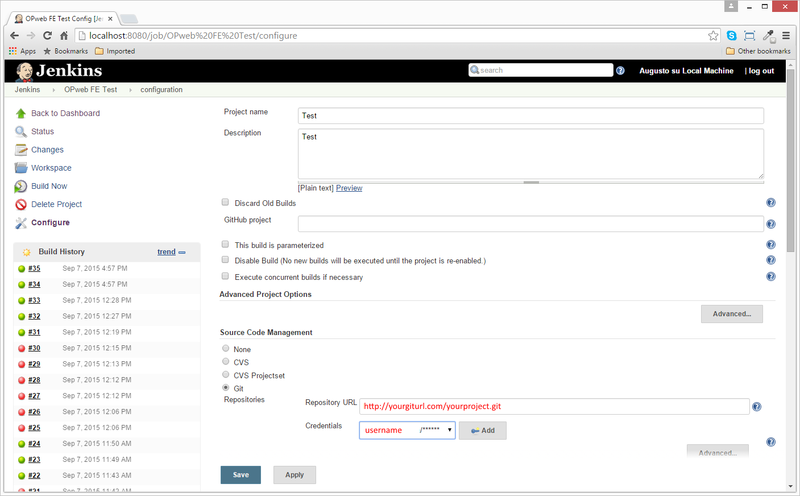 Provide the git project url ang give the right username/password entry in order to connect Jenkins to the repository. If can create a new user by clicking the aside “Add” button to do this. After taht you can change the “Branches to build”. We choose to check-out the develop branch. Git is now configured and we can move onto Build Triggers. We want to trigger a build every time our source code changes; we achieve this by creating a “Build Trigger” which polls our source code repository. When a change is detected a new build is triggered and a new deployable package is generated. Under the Build Triggers section, tick the Poll SCM checkbox. DOW The day of the week (0–7) where 0 and 7 are Sunday. To allow periodically scheduled tasks to produce even load on the system, the symbol H (for “hash”) should be used wherever possible. For example, using 0 0 * * * for a dozen daily jobs will cause a large spike at midnight. In contrast, using H H * * * would still execute each job once a day, but not all at the same time, better using limited resources. The H symbol can be used with a range. For example, H H(0-7) * * * means some time between 12:00 AM (midnight) to 7:59 AM. You can also use step intervals with H, with or without ranges. Empty lines and lines that start with # will be ignored as comments. In addition, @yearly, @annually, @monthly, @weekly, @daily, @midnight, and @hourly are supported as convenient aliases. These use the hash system for automatic balancing. For example, @hourly is the same as H * * * * and could mean at any time during the hour. @midnight actually means some time between 12:00 AM and 2:59 AM. Finally we just need to tell Jenkins how to build the solution when changes are detected. This is done via the “Add build step” button under the Build section. We want to reach this goal: provide a visual studio solution ==> generate a build ==> run tests* ==> create a publish package ==> deploy via ftp. * not included yet in these guide. In order to accomplish these steps we start from “Add build step” and in this instance select “Execute Windows batch command”. set path variables for project, destination foldert, etc. copy the created package into a destination folder in order to be moved via FTP on a specific Test server.